I was nineteen or twenty years old the first time I met R. Daneel Olivaw. I didn’t know what to make of him. Was he a good guy? Did he care about humans? What kind of person was he? I was maybe 24 or 25 when I made it to the end of Daneel’s life. I like that Daneel has been a part of my life all these years. I think my early 20s was the perfect age for me to get to know him. 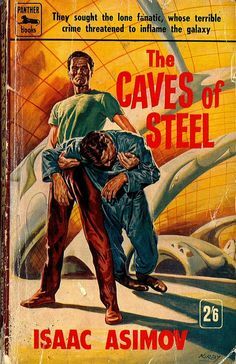 Prior to writing The Caves of Steel in 1952, Asimov had already written a handful of robot short stories that had been published as I Robot in 1950 (Asimov reportedly protested the title of the collection, as another author had already used that title, but his publisher didn’t care. But that’s a whole ‘nother story). 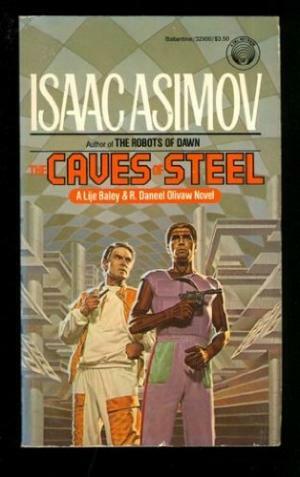 When unsure of how to stretch a robot story out to novel length, Asimov’s editor suggested he write a mystery novel, and make one the detectives a robot. That one conversation started everything. The Caves of Steel takes place roughly three thousand years in the future, and humanity is a star faring race. We’ve colonized planets, tried to terraform planets, lost some colonies and built others. While the humans of space are living in the future, humans on Earth seem to be stuck in the past. People on earth mostly live in gigantic domed cities (sort of arcology-esque? ), and rarely if ever leave the domes to stand under natural sunshine. Many Terrans resent the Spacers, for a variety of reasons that Asimov touches on. “Clinging to the past” seems to be a character trait for many characters in this book. Detective Lije Bailey has just been assigned the strangest case: He’s to investigate the murder of a visiting Spacer. Stranger yet, the Spacers demand that Bailey partner up with one of their own. His new partner is R. Daneel Olivaw. The “R” stands for Robot. If Bailey is going to solve this case, the first thing he’s going to have to do is get over the revulsion he feels for Daneel. And the first thing Daneel is going to have to do is get really good at passing for a human.